Posted by Jace Stolfo on Wednesday, July 22nd, 2009 at 3:27pm. The Ada County real estate market continued to improve with 23% more home sales in June than May (559 vs. 428). Compared to a year ago, home sales were actually up 5%- only the second year-over-year increase in the last three years. 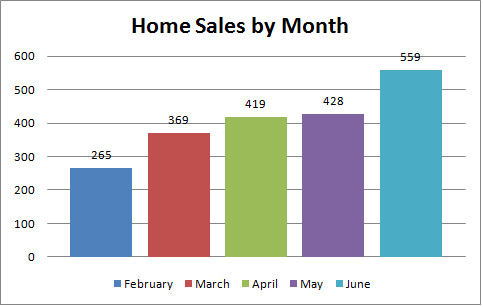 Below you can see Ada County homes sales by month since February. Unlike most years, the number of homes for sale in Ada County has actually decreased this spring/summer. 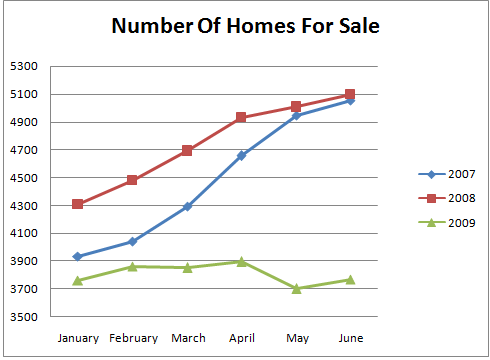 As you can see from the graph below, 2007 and 2008 surged to more than 5000 homes while 2009 has stayed around 3800. The increasing sales and stable inventory of has brought more balance to the real estate market. 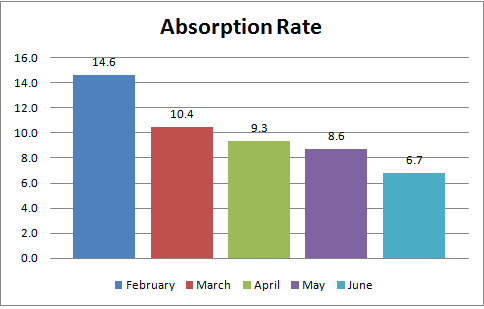 The absorption rate in the Ada County has dropped from 14.6 in February of 2009 to 6.7 in June of 2009. This is the best absorption rate the Ada County real estate market has seen since April of 2007. Data Source: Intermountain MLS (IMLS). Information not guaranteed.